Today we’re happy to welcome back to AC 2nd junior History/Social Studies Education major Kelly Van Wyk (’15), who last month joined other members of Bethel’s Model United Nations team at a national conference in Chicago. Assigned to represent the country of Austria in the same semester in which she is taking HIS354 Modern Europe, Kelly wrote this reflection on the importance of historical context to diplomacy. The dais was progressing toward our direction in the roll call vote. We would have to make a decision soon. We were next. I looked toward my teammate and she nodded. For some reason, the imaginary slogan “What Would Austria Do?” flashed through my head. There was no going back. “Yes!” I declared loudly. “Austria votes yes.” The dais recorded our vote and continued through the roll of First Committee. After each country had recorded their vote and the total was tallied, the dais announced that the current resolution for the establishment of a nuclear-free zone in the Middle East had passed. Sheraton Conference Room IV filled with applause as the First Committee breathed a collective sigh of relief that we had managed to build consensus and actually pass something on the topic. This was one of the high points of my first experience at a Model United Nations event. In Model United Nations, students must pretend they are delegates sent to represent a country that serves on various United Nations committees. In order to prepare for such a meeting, students must research the issues that their committee will debate with a focus on their own country’s particular interests and policies. Participants are encouraged to remain in character and work through the issues at hand with the purpose of the United Nations as a consensus building body kept in mind. 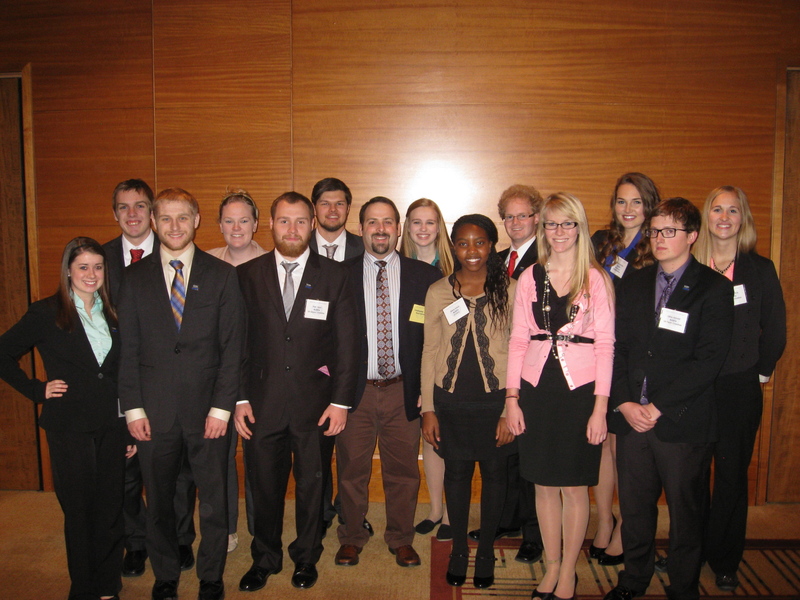 In the American Model United Nations, our delegation was one of approximately 140 other colleges and universities from across the United States to attend the AMUN conference in downtown Chicago. 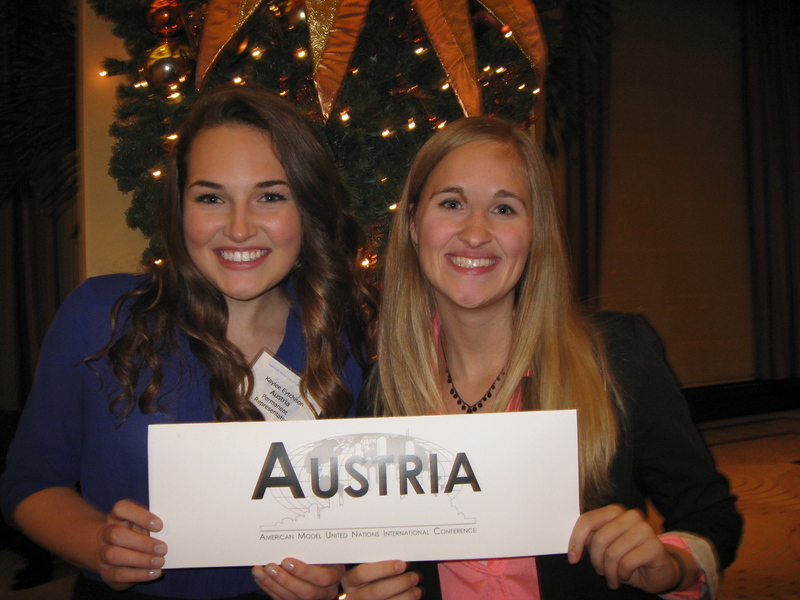 Over the course of four days, our Bethel team of thirteen student-delegates and one advisor worked in various committees to represent the nation of Austria’s interests as best as we could. In First Committee, the one that I was working with, our group would be debating two disarmament and international security issues: (1) the establishment of a nuclear-weapon-free zone in the region of the Middle East and (2) problems arising from the accumulation of conventional ammunition stockpiles in surplus. Needless to say, our work was cut out for us. When all was said and done, our committee presented two passed resolutions to the General Plenary where one was passed and the other was tabled — a seemingly small reward for the twenty-five hours we had spent in session. However, over the long weekend I learned that the process of building and reaching political consensus is indeed challenging, but not impossible. With all of the nations represented in our committee, it was an arduous task to understand, let alone collaborate with 140-odd nations with different cultural backgrounds and foreign policy goals. Because of this diversity, I gained a new insight into the role that history and context play in diplomacy. To prepare for the conference, I had to familiarize myself with the national history of Austria and found myself researching Austria’s permanent neutrality, membership in the European Union, and self-establishment of a completely nuclear-free nation. It was in rooting these recent decisions in the context of modern European history that I began to get a feeling of what it means to be Austria. Yes, knowing Austria’s past informed and guided the decisions of the present, but there was more to the connection between past and present. History lays a foundation for diplomacy in a way that I did not fully understand until I put it in the context of model UN. This idea of collective memory reminded me of the concept of Volksgeist, a German term from my Modern Europe history course which translates to “spirit of the people.” The notion of Volksgeist was used to make history a rallying point of common identity for a nationalist group. To this day, history is still used as principle of unification for nations. However, I saw at model United Nations that where history has the power to unify, it also has the ability to produce the opposite effect. A nation’s history builds the framework for future relationships and sometimes the past leaves a nation with a very poor foundation. For example, American diplomat Ian Kelly was the keynote speaker at the UN conference, and an audience member asked him what was one of the biggest influences on his work with the Russian Federation. Ambassador Kelly answered “Russian political history. It really has shaped how nations view Russian diplomatic relations of the present.” The ambassador’s statement served to me as a reminder that history binds us all together, but our ties to history should be remembered for what they are and not cast in a light that paints them in a way fits present purposes. History is not something that I manipulate to shape my present; it simply is a part of who I am. Knowing what I know about Austrian history, I think that Austria and its people probably understand this truth more than most. Gaining this insight from my participation in Model UN was a valuable contribution to my understanding of history at work. At Model UN, though I was a history major in a political science major’s world and often felt like a minnow among sharks, the experience confirmed for me the importance of the study of history and the role that I want to play in teaching it. Read more from Kelly in a recent post on her experience as a History major active in intercollegiate athletics. And, of course, it has pages and pages of recipes. So I’ve taken to offering five points of extra credit to any student in HIS354 Modern Europe who takes the time to research a recipe, cook it, and present the results to class with a bit of explanation. We had three students take me up on that offer this year, but while they all chose desserts of some sort, the approach of Christmas reminds me that Mrs. Beeton’s repertoire went far beyond sweets. So if you’re the kind of person who would read, say, Charles Dickens’ A Christmas Carol and think to yourself, “I wonder what the Cratchits’ Christmas dinner tasted like?”, then this post is for you! And your total cost according to Mrs. Beeton’s estimate… 8 shillings, 6 pence… Or about $2.12 in 1861 dollars… Which is approximately $53 today. Our last Modern Europe Journal entry for the semester comes from Tom Keefe, one of our History/Social Studies Education majors. (See his earlier post on family history and immigration.) Here he takes us through his process in researching the influence of the Paris Commune of 1871 on 20th century Communist revolutionaries like V.I. Lenin and Mao Zedong. For my final research project, I wrote a paper entitled, “The Paris Commune of 1871: How a Brief and Ambiguous Political Event Became a Source of Motivation and Hope for Communists in the 20th Century.” The Paris Commune of 1871 was a political movement that took place in the French capital in the spring of 1871. It is often viewed of as a continuation of another type of “Commune” government that briefly took power during the French Revolution from 1789-1797. Adolphe Thiers, the leader of the Nationalist, provisional government. When this history of the Commune was first briefly mentioned during a lecture, I was incredibly intrigued by the story. I guess the American revolutionary ancestry deep inside of me still roots for a disillusioned group rising up against “oppressors,” but due to time constraints in class we were unable to delve into the event in any significant way. The only point that was mentioned in detail was the aforementioned “Bloody Week.” Upon the arrival of the French military in Paris, 20,000 Communards were killed and relative “order” restored as the 5th French Republic took over following the fall of this temporary government. A depiction of executions that took place during “Bloody Week,” May 1871. I was hooked, and became even more intrigued when preliminary research seemed to indicate that many influential men in history seemed to look to this event as an inspiration of sorts. It appeared as if Vladimir Lenin and Mao Zedong, both incredibly influential communist leaders during their times in power, had looked to the Paris Commune as an example of what they desired their governments to be. A depiction of Parisians rebelling against the Nationalist Government in March 1871. In addition, the government did not necessarily achieve any “communist”-type reforms. Rather, their social reform seemed to be instilled with liberal ideals, rather than strictly Marxist ones. Furthermore, I was discouraged by the fact that some historians I encountered did not put any stake in the connection between the Paris Commune and the rise of communism in the 20th century. Needless to say, I was relatively demoralized, and ready to completely alter my research. Then, I encountered historian Stewart Edwards, whose comments helped to shape and focus my analysis of the impact of the Commune on the rise of Communism in the 20th century. The seventy-two days from 18 March to 28 May 1871…though too short to carry out any permanent measures of social reform, were long enough to create the myth, the legend, of the Commune as the first great workers revolt…which was to inspire communists in the period up to, and even after, the Russian Revolution of 1917. (Stewart Edwards, The Communards of Paris, 9). This statement allowed me to see the influence of the events in Paris in a whole new light. I later encountered rhetoric from both Lenin and Mao (paragraph 9) who made explicit references to the Commune early in their political careers. They both desired that in some way, the governments they led would come to resemble those seventy two days in Paris. At this point, I was encouraged by the potential connection, but also extremely confused. Why would these men aspire to a government whose reign lasted less than three months, and ended in the death of thousands? A portrait of the Chinese communist leader Mao Zedong. Something clicked as I began to again look through the perceived “failures” of the Commune. Despite its un-Communist nature, 20th century communists could still look into those seventy two days in Paris and dream. Despite the obvious truth that the government was not a communist one, many factors added to this desire. The brief time of the government, the limited geographical influence (it never got outside of Paris), and the brutal, (and in the minds of communists) unjustified end to the Commune created a mystique surrounding the Commune. This, in accordance with aspects of the government such as anti-clericalism and voting practices, which communists saw a a good model, produced a sentiment which elevated the influence of this brief government in France. A portrait of Soviet leader Vladimir Lenin. Although the government did not necessarily accomplish anything politically or socially significant, within this mystique of the Commune lies its historical significance. It was by no means the sole primary reason or motivation for Lenin and Mao rising to power in their nations. Yet, through their fondness of the event, the Commune needs to be a recognized factor in the rise of the influence of communism in the 20th century. Therefore, through the careful investigation of many historians and historical figures, it is evident that there exists a connection between the brief and ambiguous nature of the Commune and arguably the most influential political movement of the 20th century. The Paris Commune of 1871 did have an impact on communist movements in the 20th century. Although it was not as significant as I had initially hoped or imagined, the tantalizing effect of the Commune persisted into the 20th century, making it a time to be remembered in history. This brief time in Paris helped to inspire a dream that would be pervasive and significant in the world in the 1900’s. Stewart Edwards, ed. The Communards of Paris, 1871, (London: Thames and Hudson LTD, 1973), 9. The second Modern Europe research project to be presented via a blog post comes from History/English Lit double-major Jenna Kaliszewski (’12). In 1996 Boris Yeltsin created a commission to find a new Russian national identity. The question that faced Russians, and what I wanted to research was how would that identity be constructed? What would post-communist Russian identity look like? It was this definition that Russia was trying to find after the fall of the Soviet Union, and the search for a Post-Soviet identity began in the late 1980s, during the thaws that occurred under Gorbachev and eventually the dissolution under Yeltsin. In the ideological vacuum opened after the Soviet fall, multiple theories emerged about how Russian identity should be characterized. In theory both Yeltsin and Putin supported the civic definition of Russian nationalism, which became the official version of Russian identity. Indeed, Yeltsin attempted to commemorate events surrounding the fall of the USSR, but these found little popular support and success. Popular opinion did not identify with the events founding the Russian Federation, instead the belief in Russia after the initial excitement in 1991 was that Russia did not gain independence but lost power and prestige in the world. The acts of Yeltsin that were popular included the restoration of the imperial tricolor flag and two-headed eagle, and in 1995 the Soviet flag was recognized as a state symbol. While Yeltsin was in office it became apparent that anti-communism was not a popular stance, and Putin favored communists a little more. He combined tsarist and Soviet Union symbols, trying to create a multi-ethnic identity based on the positive elements from the imperialistic and Soviet traditions. Under both Yeltsin and Putin it was recognized that a completely new Russian identity could not be created. Popular opinion did not support nationalist identification with events associated with the fall of the Soviet Union, but related back to both the imperial and Soviet history of Russia. This created an interesting blend of the two with the democratic trimmings that were brought in after the collapse of the USSR. The physical manifestations of this reveal the complicated creation of a new Russian identity in association with both the imperial and Soviet past. Post-soviet Russia was more successful in figuring out what to do with old monuments rather than creating new national symbols. In Moscow the names of streets did not retain the names of Soviet leaders and famous people, but were restored to their old names, those they had under imperial control. Yet the Lenin Mausoleum, despite its controversial symbolism, was never destroyed. Sites relating to the Great Patriotic War have been glorified as a Russian victory maintaining their significance. Also popular are Tsarist-era sites that connect back to Russia’s spiritual and cultural heritage. The rebuilding of Russian Orthodox churches, like the Kazan Cathedral, is significant because these were torn down by the Soviets. With the Soviet Great Patriotic War monuments and Tsarist-era cites the new Russian identity was formed. For example resumed construction of Victory Park, a Soviet vision for a memorial of the War, included religious elements from the Tsarist history in the post-Soviet vision. Victory Park is a perfect example of the new Russian identity being shaped in this time period, consisting of a little bit of old and recent history. Instead of constructing a national identity, from the events surrounding the fall of the Soviet Union and turning to a civic-democratic ideal and symbolism, the new post-Soviet Russian identity was constructed from the past, both imperial and Soviet. Peter J. S. Duncan, “Contemporary Russian Identity Between East and West,” The Historical Journal 48 (March 2005): 286-7. Liah Greenfeld, “The Formation of the Russian National Identity: The Role of Status Insecurity and Ressentiment,” Comparative Studies in Society and History 32 (July 1990): 549. Alexander Agadjanian, “Public Religion and the Quest for National Ideology: Russia’s Media Discourse,” Journal for the Scientific Study of Religion 40 (September 2001): 353. Greenfeld, “Formation of Russian National Identity,” 590. Alexey D. Krindatch, “Changing Relationships Between Religion, the State, and Society in Russia,” GeoJournal 67 (2006): 271. Benjamin Forest and Juliet Johnson, “Unraveling the Threads of History: Soviet-era Monuments and Post-Soviet National Identity in Moscow,” Annals of the Association of American Geographers 92 (September 2002): 527. Forest and Johnson. “Unraveling the Threads,” 328; Duncan,“Contemporary Russian Identity,” 286. Duncan,“Contemporary Russian Identity,” 286; Forest and Johnson, ”Unraveling the Threads,” 538. Olga Gritsai and Herman van der Wusten, “Moscow and St. Petersburg, a Sequence of Capitals, a Tale of Two Cities,” GeoJournal 51 (2000): 40-41. Forest and Johnson, ”Unraveling the Threads,” 532-4. Gritsai and Wusten. “Moscow and St. Petersburg,” 40-41. Forest and Johnson, ”Unraveling the Threads,” 531-2. Last week students in Prof. Chris Gehrz’s Modern Europe course read Christopher Browning’s book Ordinary Men, the acclaimed history of a reserve military police unit in the German Army that in 1942-1943 took part in the slaughter and deportation of thousands of Jews in Poland. On Wednesday, class consisted of a mock trial of three of the “ordinary men,” with students playing the roles of prosecutors, defense attorneys, and jurors. The “lawyers” wrote “briefs” ahead of time for their journal entries, then after the scenario was completed, “jurors” were asked to vote on verdicts (and, if guilty, appropriate punishments) for each defendant and to write a 250-word reflection on the hardest decision they faced. Here are the three cases, the verdicts, and (with student permission) some of the arguments that the jurors agonized over. [from a student voting Guilty and recommending life imprisonment] We talked in class about the question of where does the line of guilt end within the chain of command. The reason I ended up finding Kammer guilty was because I compared his case to that of Private Niehaus. It is the difference between following orders and being the one giving orders that sets apart the guilty from the not guilty. The decision on Kammer was also difficult for me because the situation was during a time of war. While the casualties of the Holocaust are more numerous than those of other wars, it is important to realize that in times like that, we cannot punish every single person who was involved. The reason Kammer is guilty is because he was partially in charge of the events in Jozefow. He could have called off the orders and taken the punishment for that rather than allowing a mass killing of Jews. Kammer was fully aware of the implications of the orders he was handing out. I had to find him guilty because of that. My decision of what his sentence should be was not difficult because while I believe that his crime was great, I do not think that he should have to die because of it. In looking at crimes during a war, it is difficult to make sentences because so many people would then have to be found guilty. Summary: A former cigarette salesman who is standing in for the other enlisted men in the battalion, Niehaus (not his real name, but the one used by Browning) shot one person and then asked to be relieved of duty. [Guilty, but with a light sentence] On one hand, he shot a woman, from an order. Taking his comrades into consideration, he could have done a lot more damage. However, taking some of his other comrades into consideration, he could have stepped away from the situation all together. A tough aspect of being a historian is empathy, and the attempt to reach into the minds of those who were faced with a certain decision. As a female student, living in 21st century (safe) America, I have absolutely no clue what it means to partake in warfare or violence. Furthermore, I have no valuable perspective into the minds of soldiers, who dealt with the pressure of comradeship. Although other soldiers were known to walk away from the shootings, I would imagine there was pressure to follow the orders and be “a man about it”. Moreover, he shot one person. Now, I am not degrading the value of an individual’s life, particularly one that was entirely innocent and vulnerable, but Niehaus drew the line at one, which in some ways is much better than those who chose to repeatedly kill. But the principle of the matter is that he chose to carry out the order. Sure, someone else would have done it, regardless if he chose to or not, but he was nonetheless given the option. Because this was controversial, I granted him a small sentence. He performed the deed, yet there were many external influences and reasons to believe that this was not entirely his responsibility. [Guilty, but with a lesser sentence] Although the realities of conformity and peer pressure were pervasive in men like Niehaus, they still do not justify any killing of any sort. In spite of, in my mind, his obvious guilt, his sentencing was a little more difficult. In comparison to his peers, Niehaus did everything he could to avoid the killing of innocent Jews following his initial murder. He realized his mistake, and turned from these actions and asked to partake in different activities. Should he be rewarded for recognizing the injustice of the situation and avoiding more shooting as best as he could? Or is comparison obsolete in assessing and judging those involved in the Holocaust? Again, these questions are multifaceted and complex, which made the case of Niehaus more difficult than the others. It was my inclination to believe that Niehaus may have been less guilty because of the heinous actions of his peers, but at the same time, some men did not even participate in the initial shooting, and Niehaus did not take advantage of this opportunity.